The Boathouse is much more expansive than it appears when you first come across the entrance in The Landing. 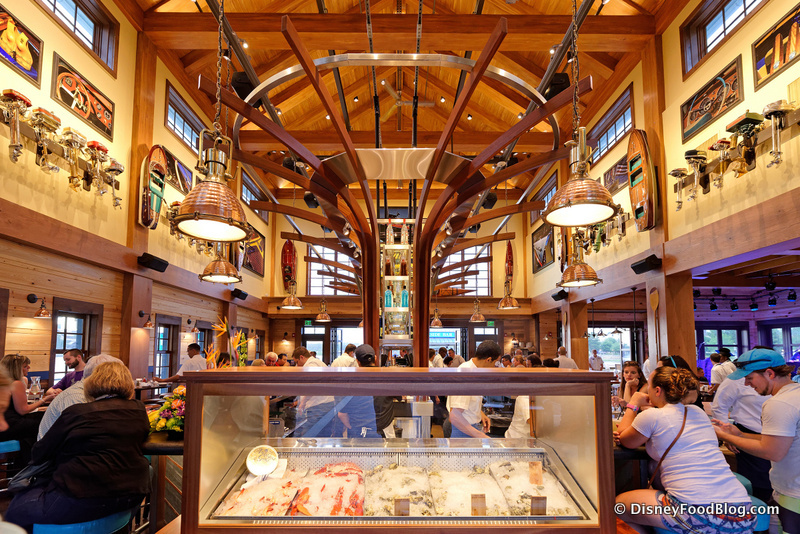 On this visit, we were seated very near the Captain’s Raw Bar. From what I’ve experienced, it doesn’t seem difficult to score a walk-in seat or table during the day (on a weekday, at least). 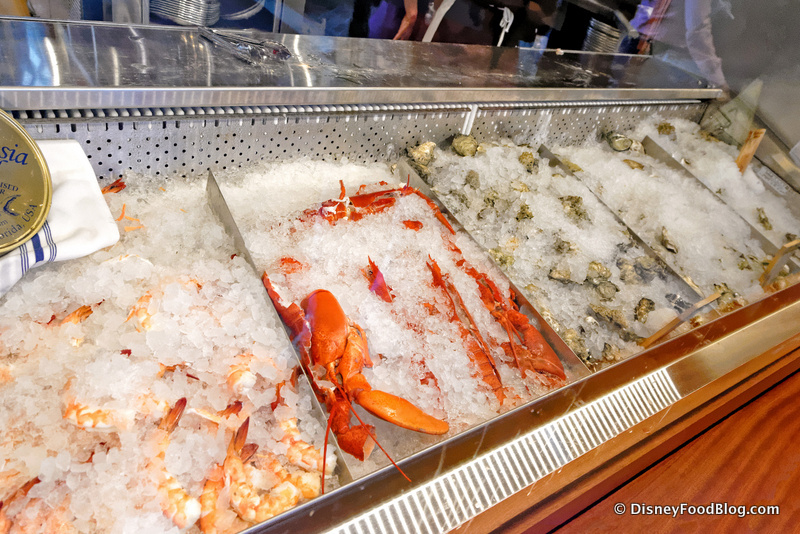 Here is a look at the inspiration for the room, the Raw Bar itself. I hesitate to use the word “airy” to describe the space, since every inch is utilized for seating or to tuck in some more nautical decor. 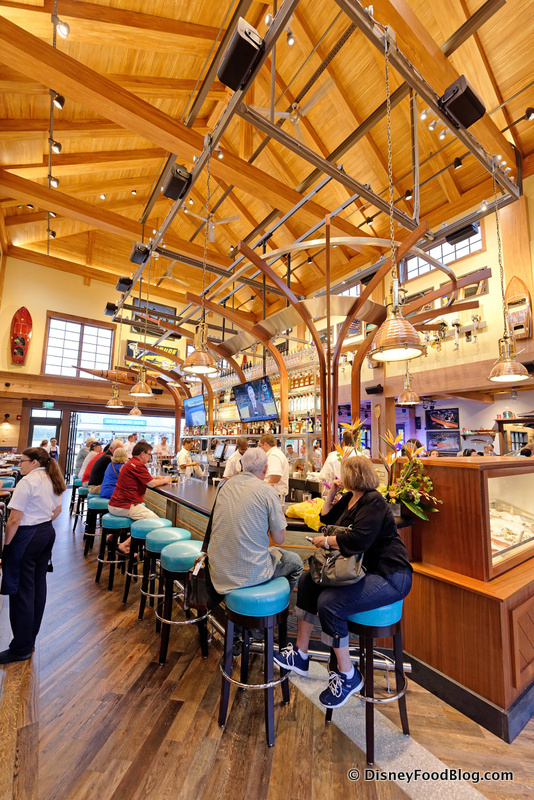 But the light woods, aquamarine accents, waterfront-facing windows, and clear lighting fixtures somehow come together to encourage a feeling of openness in the midst of everything going on, even if you’re seated right in the middle of the action at the bar. 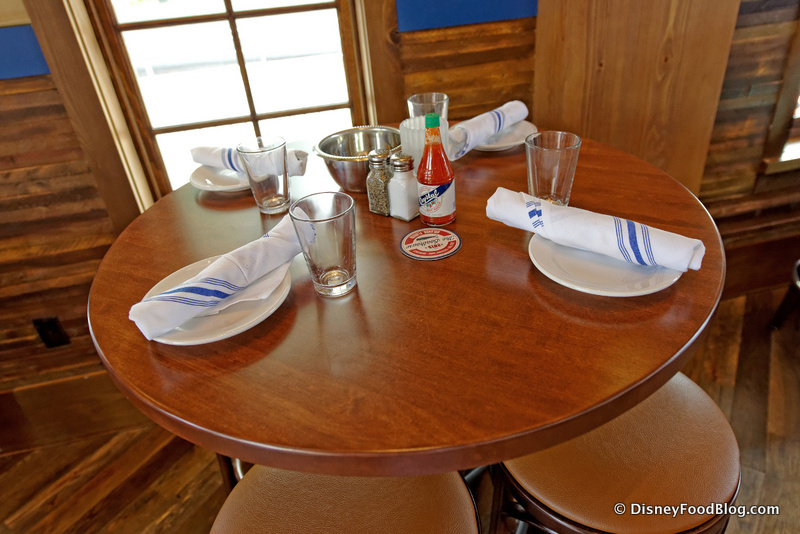 Full table settings are available in the bar area as well. No matter where you sit, though, be sure to spend some time outside checking out some of the outdoor fun, either before or after your meal or drinks. Guests enjoying private cruises (booked separately) on Amphicars or water taxis dominate the water scene around The Boathouse… and even the rest of Village Lake! They really are something to see, whether or not you book a tour of your own. But for us, it’s back inside to our table! The Boathouse menu is focused primarily on steaks and seafood, and it’s true that a lot of the headliner items cost a pretty penny (you may recall our $12 side of asparagus from our first visit). 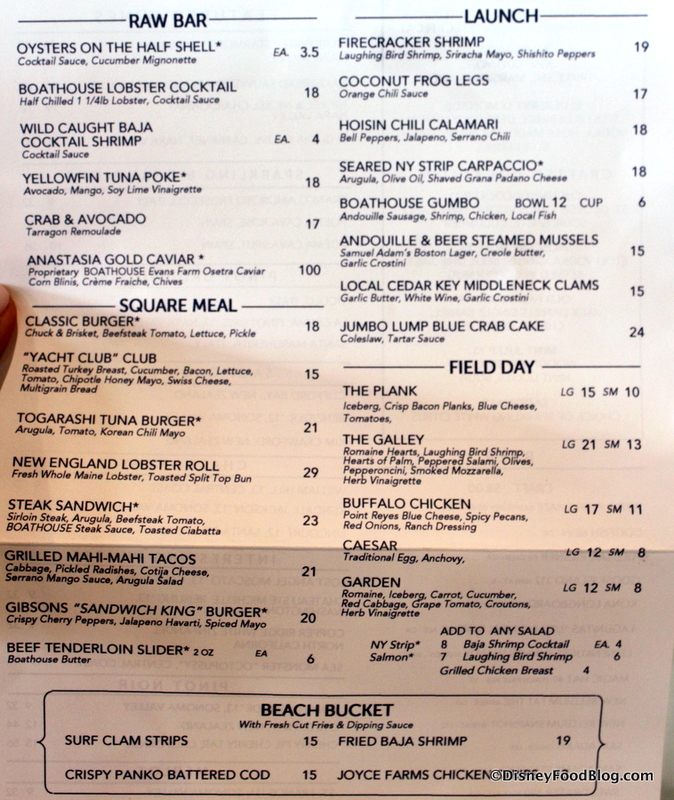 But on my more recent stop, I wanted to check out some of the sandwich options that — while still a splurge — are definitely less costly than, say, the $115 Long Bone Rib Chop for two. And we’ll get to that shortly, but, hey, we are in one of the bar areas, and you know how the saying goes… When in Rome, check out the drink menu (or something like that 😉 )! How about a bit of a refresher to begin? 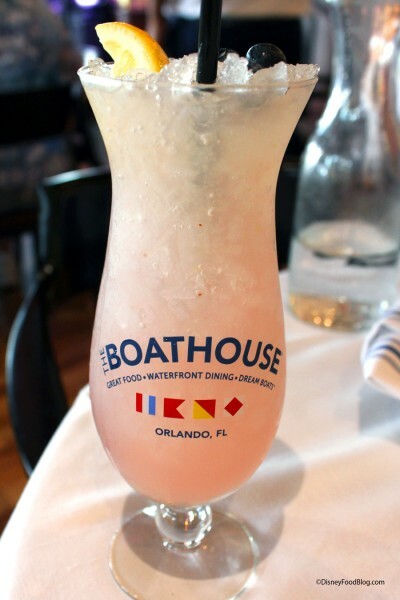 The Blueberry Lemonade — one of the Boathouse Specialties — is a mix of blueberry vodka, lemon vodka, house-made lemonade, and fresh blueberries. Tart and tasty? Yes to both — the drink was delicious, but it did have some of that more-ice-than-drink thing going on. Okay, next we’ll finally look at that menu I promised you. Now, here’s the thing. Yes, I sat close to the bar area, and yes, it was lunch time. So, did I receive the lunch menu or the bar menu? Both! But I had to ASK for the regular lunch menu. There are several options on this bar menu that are much easier on the ol’ wallet than the initial menu release led us to believe, and I did confirm that the burger and sandwich selections (you’ll see them under “Square Meal”) are available throughout the day no matter where you sit, which is great news for folks who want to experience The Boathouse without entirely breaking the bank! The menu changes frequently (in fact, daily!) 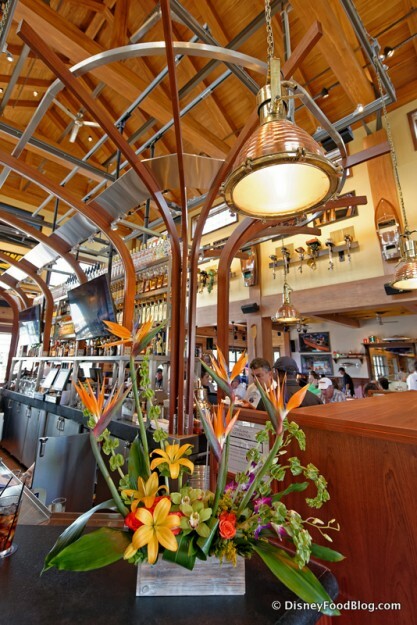 at The Boathouse, focusing on the freshest ingredients available, specifically with regards to seafood. So, keep in mind that selections may certainly vary on your visit. 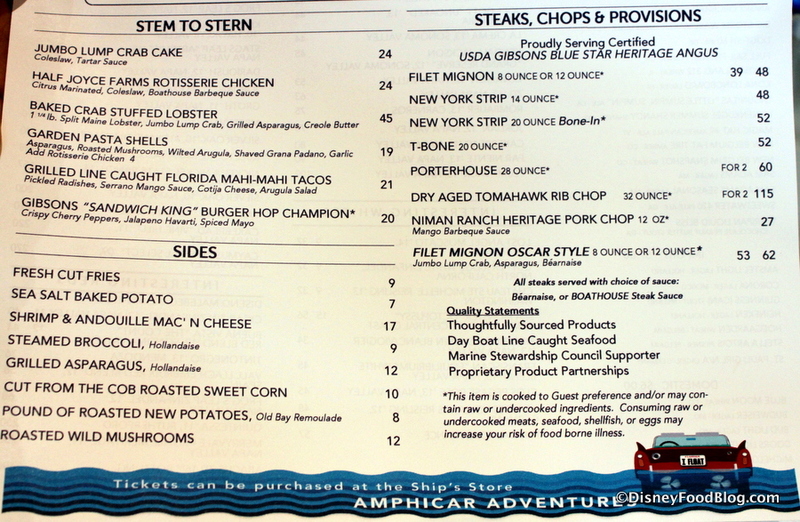 Our choices are an example of what you may be able to order (thought I’ll bet several of them are always available). Here’s the standard lunch menu. As we looked over the menu, we enjoyed the complimentary bread and butter. Pretty standard, really, but the rolls were soft and fresh. 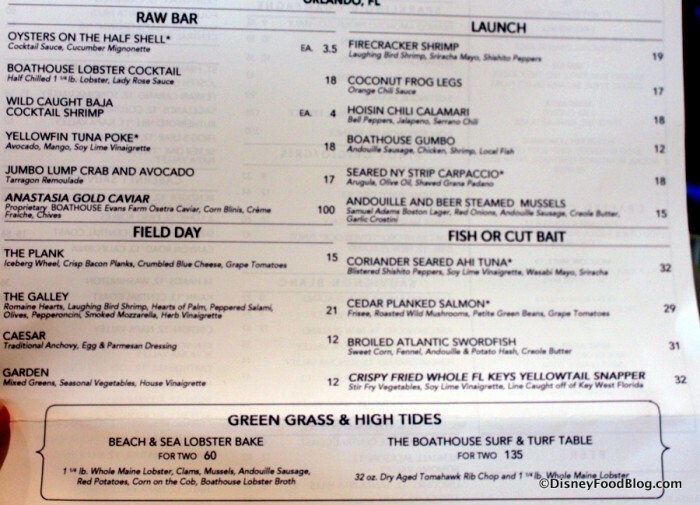 We couldn’t do without a selection from the Raw Bar, of course, especially since we were sitting right there, so my friend went with the Boathouse Lump Crab and Avocado. 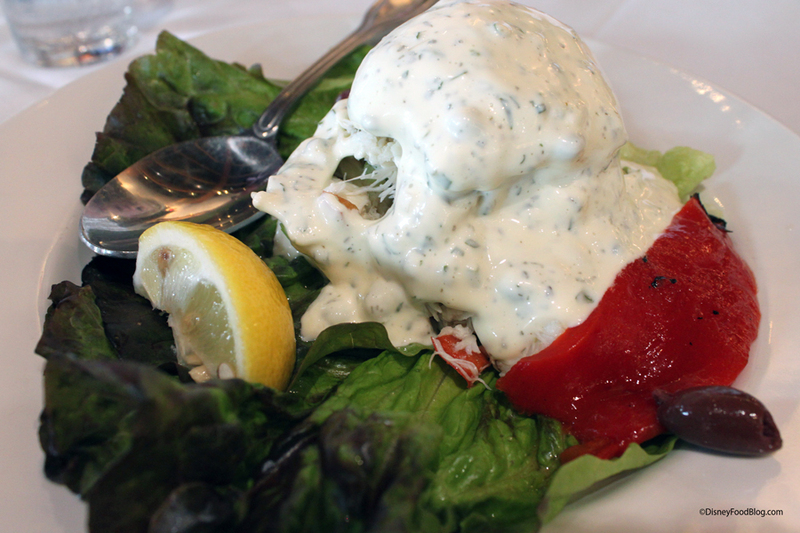 The sauce is a Tarragon Remoulade, and the seafood was wonderfully fresh. I have to admit I was kind of surprised by the sheer amount of sauce, though — I thought it to be a bit overdressed, especially with seafood of this quality, but it was tasty. I wasn’t too excited about any of the real appetizers, so I did what I often do and ordered a side dish as my app. 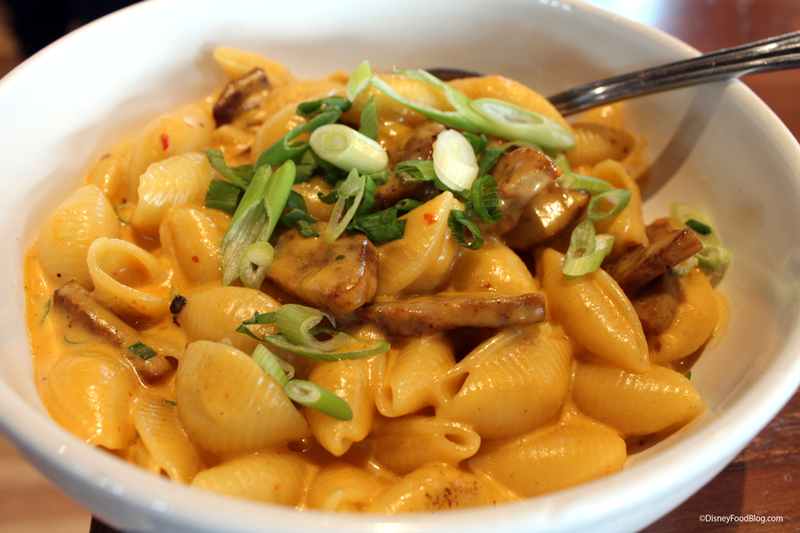 Bring on the Shrimp and Andouille Mac and Cheese…minus the shrimp! 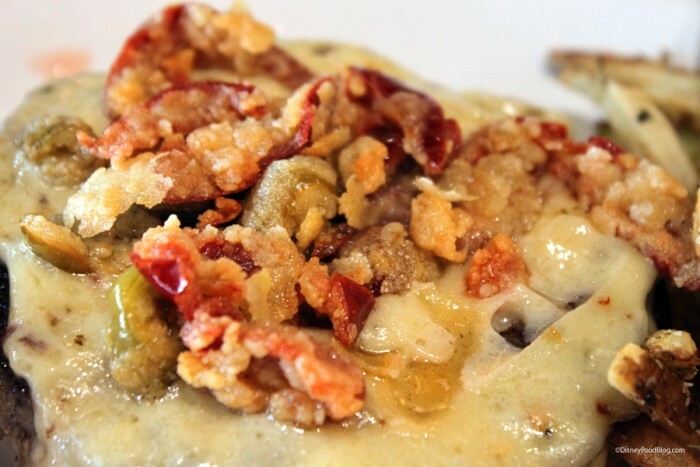 It’s cheese-y, awesome deliciousness in a bowl (just look at that thick sauce making its way up the side of the dish), and the portion is HUGE for a side dish. This is easily an entree! For the main event: I chose the Gibsons “Sandwich King” Burger on the recommendation of our server. This is an award winner — the only one with its own USDA certification. Though the Gibsons USDA Blue Star Heritage Angus is clearly the star of this beauty of a burger, toppings include crispy [fried] cherry peppers, jalapeño havarti, and spiced mayo (which I requested on the side, but ended up being super delicious). Here’s a closeup on those toppers before we dig into the beef. Are you dying?!? So gorgeous. Upon cutting in, I was happy to see the burger was well-prepared to my request (medium), while being nicely charred on the outside. 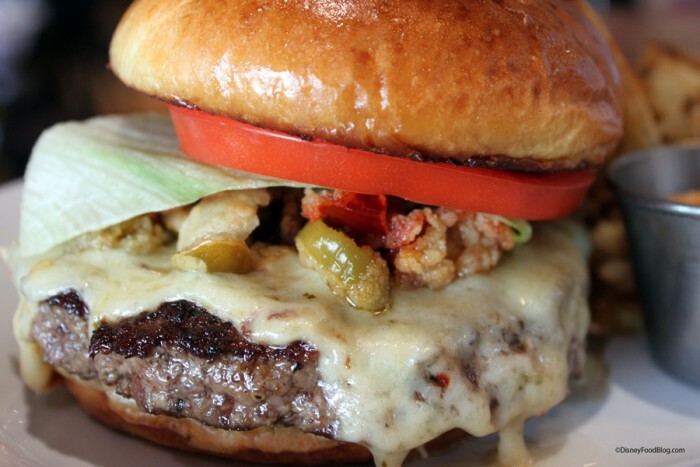 I gotta hand it to ’em: this burger was great. 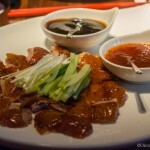 Juicy, moist, flavorful… and spicy, which I love. Oh, and those french fries you spy in the corner are hand-cut (unlike the major steak entrees where you order the sides separately, the fries come with the burger). Among these decadent dishes, the Garden Pasta Shells was ordered my by friend and provided a lighter option, made up of asparagus, roasted mushrooms, wilted arugula (that phrasing is from the menu description, not a commentary on my part 😉 ), shaved grana padano cheese, and plenty of garlic. She enjoyed it, and found it to be a good lighter option after that indulgent appetizer. Now on to dessert. All truths told, I’m not exactly blown away by the dessert options — otherwise known as “The Not So Bitter End” — at The Boathouse. They’re just not much unlike standard options in restaurants you’ll find anywhere else, for the most part. On our previous visit, we ordered the unique cornbread cake. 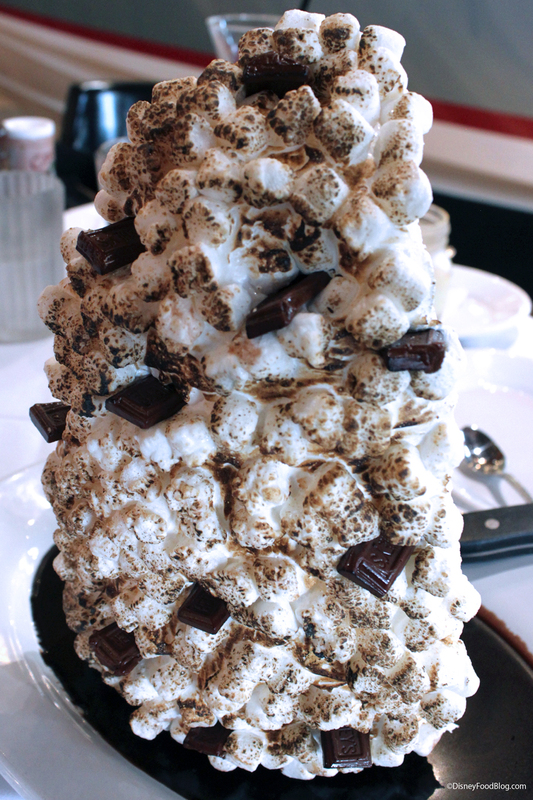 But on this visit, I knew I had to try the giant Gibsons S’mores Baked Alaska. It’s made to serve 4 (according to the menu), and — and this is not the first time I’ll make this point — it’s 40 bucks. I had to see it with my own eyes. And I must say, the presentation is kinda impressive. 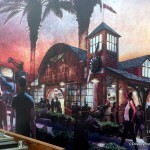 I had to snap a few pictures to take in the entire thing! The rocky road ice cream center is entirely surrounded by the meringue, topped off with torched marshmallows and Hershey Bars dotting the whole thing. It’s ginormous. That knife down there? It’s a super huge steak knife. But here’s the thing: it’s 40 BUCKS. I’m going to say that again: it’s 40 bucks. And in NO WAY does a gallon and a half of Rocky Road ice cream, some chocolate pieces, and marshmallow fluff equal 40 bucks, no matter how cool the char is. Simply put, I think it’s a huge waste of money. 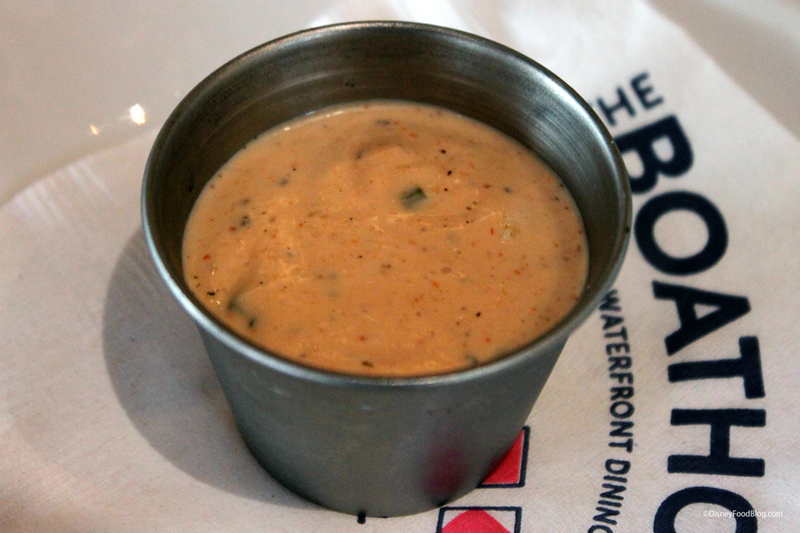 There are a lot of things going well at The Boathouse, but this non-really-Baked-Alaska isn’t one of them. 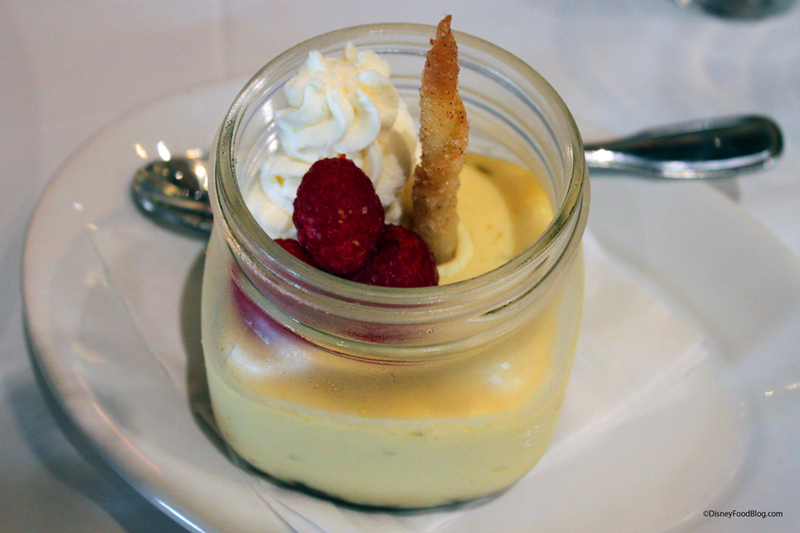 We also tried the Key Lime Pie in a Mason Jar, which was, thankfully, amazing. It was a large portion, and didn’t waste time on toppings or meringues. There’s just a ton of sweet-sour, creamy limeness and some big huge lots of graham cracker goodness at the bottom (you can’t see it in the pic, but it’s there). Perfect. 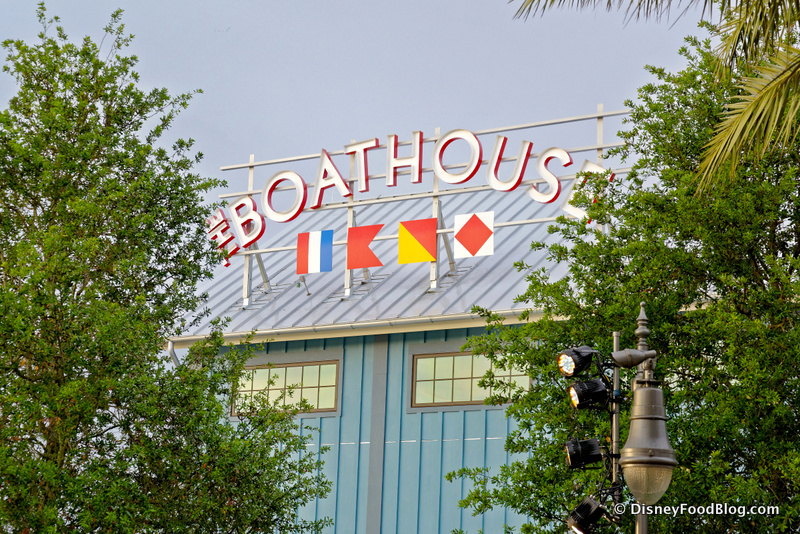 We enjoyed our first run at The Boathouse, but the sticker shock that accompanied it was a little hard to swallow. Thanks to this more recent visit, I’m happy to also be able to recommend some of the alternate dishes to the main steaks, chops, and seafood — not only because they are less costly, but are also high-quality dishes in their own right. 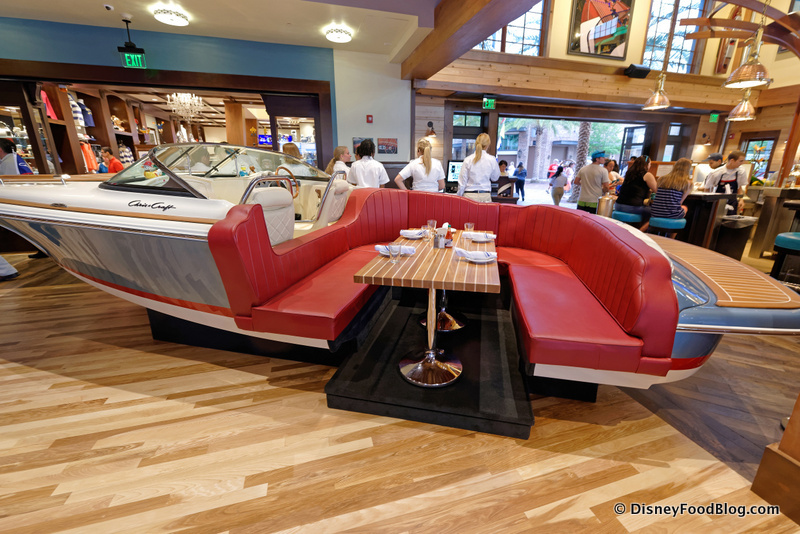 Add in the beautiful setting (not to mention some really great service on the part of the Cast Members), and I’ve gotta say, if you’ve knocked The Boathouse off your list due to the pricier items that made all the headlines in the beginning, you may want to reconsider. I think you might be pleased with your choice (as long as you avoid the $40 ice cream topped with fluff). 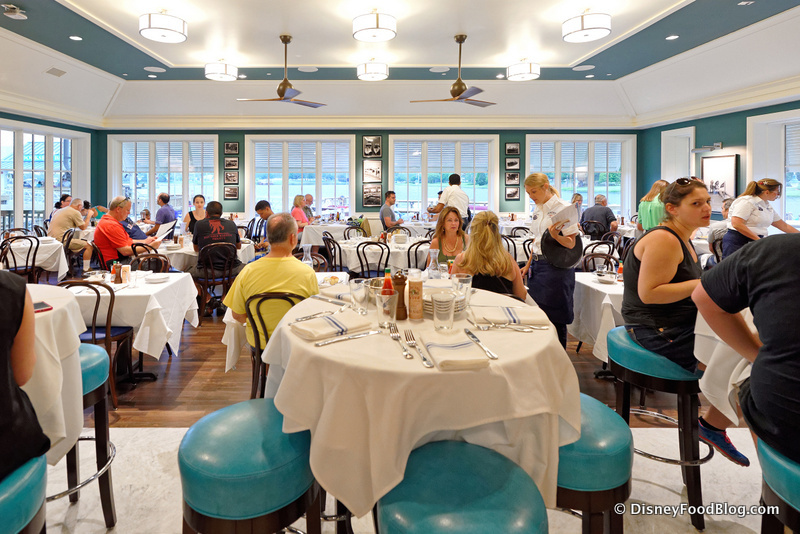 One more thing: in addition to becoming eligible for Disney Dining Plan participants (considered Signature Dining, requiring two Table Service credits) since our previous visit, a few other discounts are now accepted at The Boathouse: Annual Passholders and Disney Vacation Club Members are eligible. 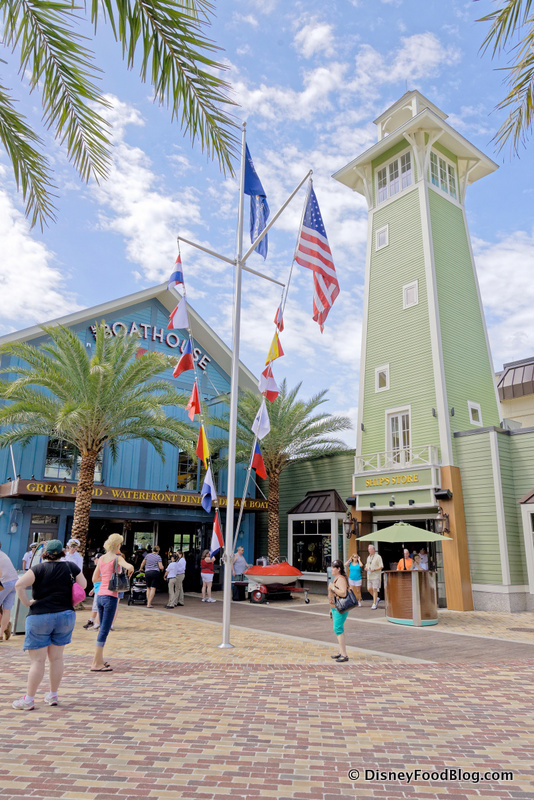 Just a little FYI in case you’ve added The Boathouse to your must-do dining experiences at the ever-expanding Disney Springs! 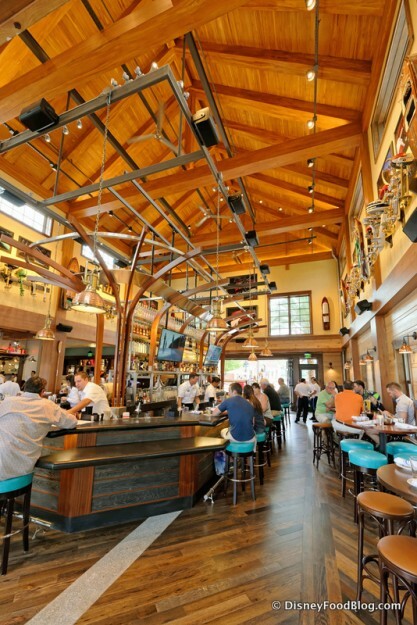 Have you paid a visit to The Boathouse yet? Please let us know about your experience with a comment! 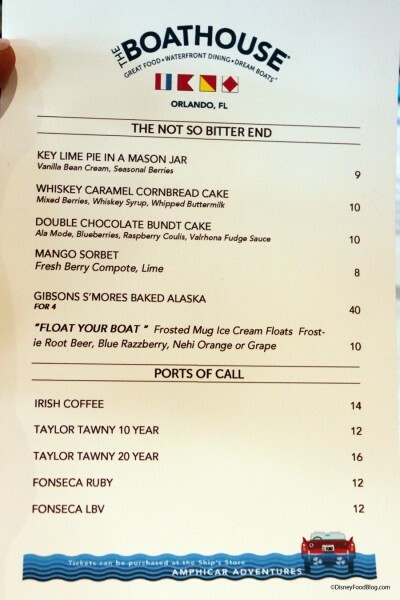 $40 for baked Alaska? That’s ridiculous! Who the heck can afford that? I feel guilty spending $12 on dessert! 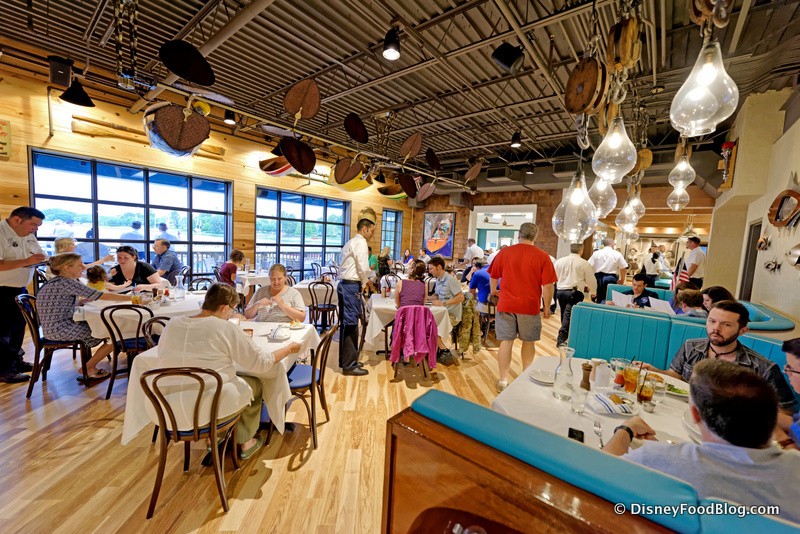 I have to say we have no desire to eat at any of the new restaurants at Disney Springs (due to their cavernous [i.e. 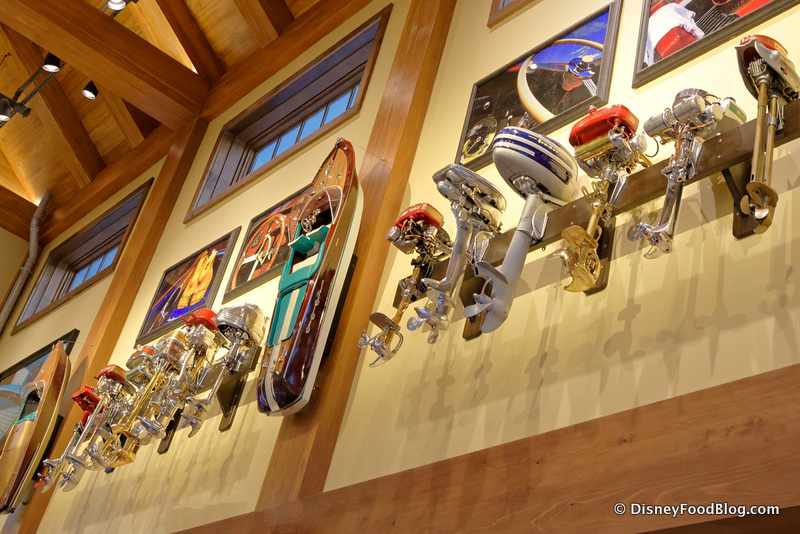 loud] settings and slightly more pricey than our other regular Disney favorites. 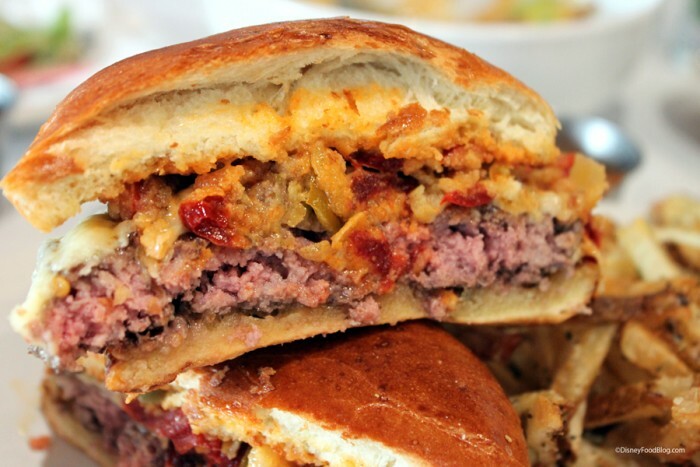 However, that burger will probably get us there (eventually…). It looks delicious! 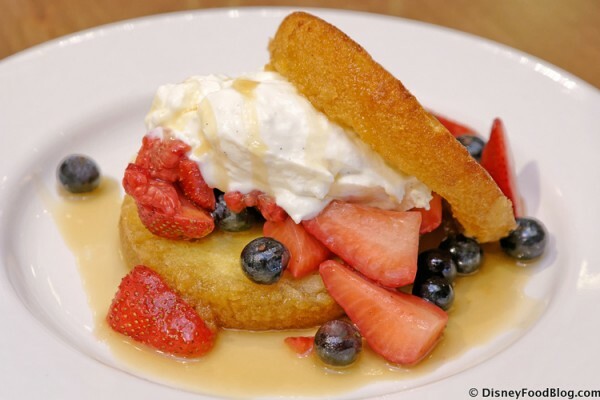 Also, I wonder if anyone but food bloggers and other Disney media have purchased the Baked Alaska? lol 🙂 Thanks for sharing! I have to say that I think one huge thing wrong with this restaurant are the actual chairs and stools. The chairs look uncomfy (I’ve sat in chairs just like those at other places, and they are uncomfy, at least for me), and the stools have no backs to them. If one is going to pay such prices, one would think one would be able to at least enjoy the meal in comfort. 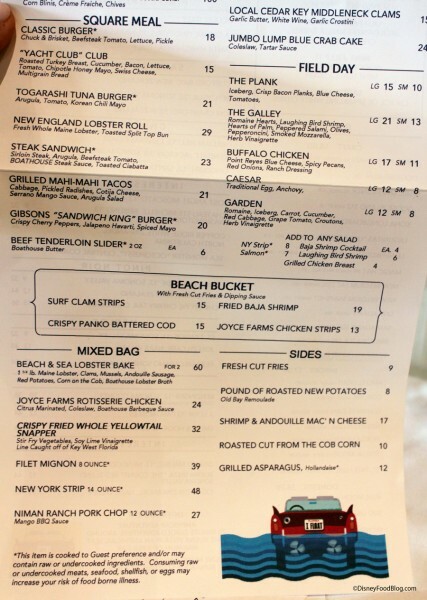 We ate at the Boathouse 2 weeks ago. My husband and I both had the broiled swordfish it was amazing. I also had the lobster appetizer and dessert which was a shock to find out they had Fosty root beer which I haven’t seen since I was 12. We were on the deluxe dinning plan. We will go back I rate it 9out of 10 on food taste. The restaurant is beautiful and the rolls were a big hit at our table. The baked Alaska could easily serve 5-6 people, which makes the per-person of $40 really not that bad, considering restaurant dessert prices. It also takes them 5-days to make it (they did a behind the scenes about it on the Chew), which explains the premium. My family ordered it the last time we were there. It was delicious and the 4 of us couldn’t finish it. Oh… it also has a very thick graham cracker crust at the bottom… you just can’t see it… We didn’t notice it until we were half way done, because of how they cut it for serving. Hi AJ, I know I can be a bit of a nay-sayer, but a lot of this looks pretty good. That Lobster bake for two for $60 looks great. Thanks for the review. Looking forward to exploring the Springs during our annual week stay-cation at our timeshare. We loved the Boathouse!! 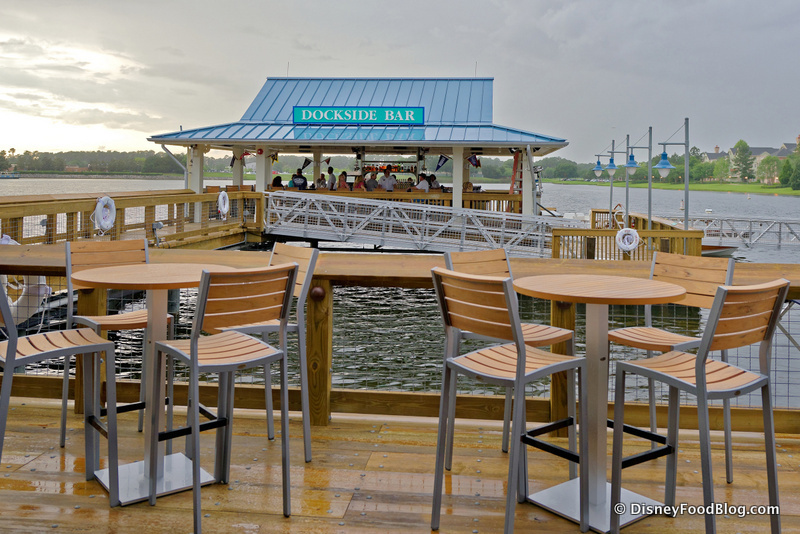 We arrived really late to Disney one Friday and grabbed a stool at the Dockside bar. (Like really late…around midnight.) 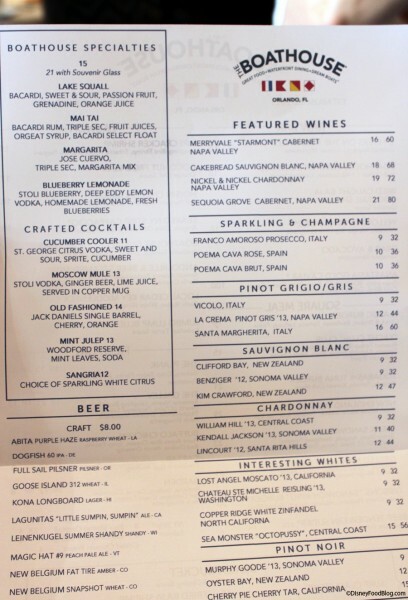 The bartender kept the drinks flowing (great selection of beer and wine) and we ordered late dinner. 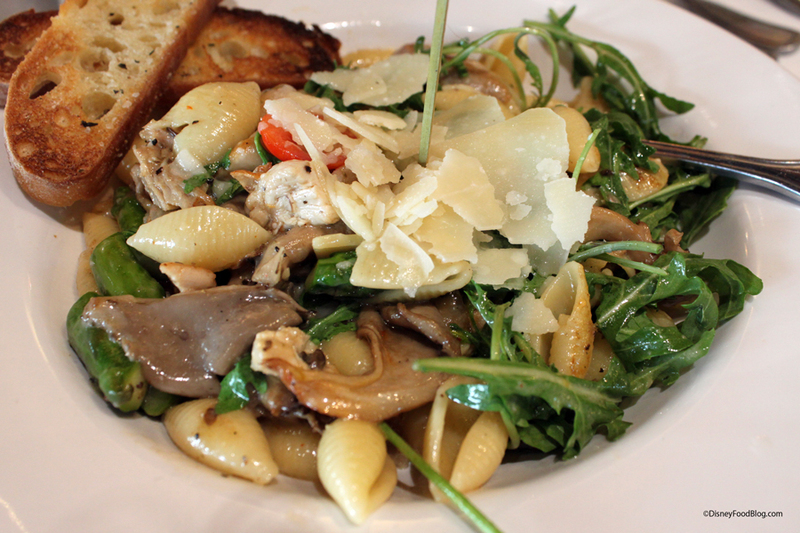 As a vegetarian I had the pasta dish, expecting it to be boring like most. It was fantastic!! And my husband loved his burger. 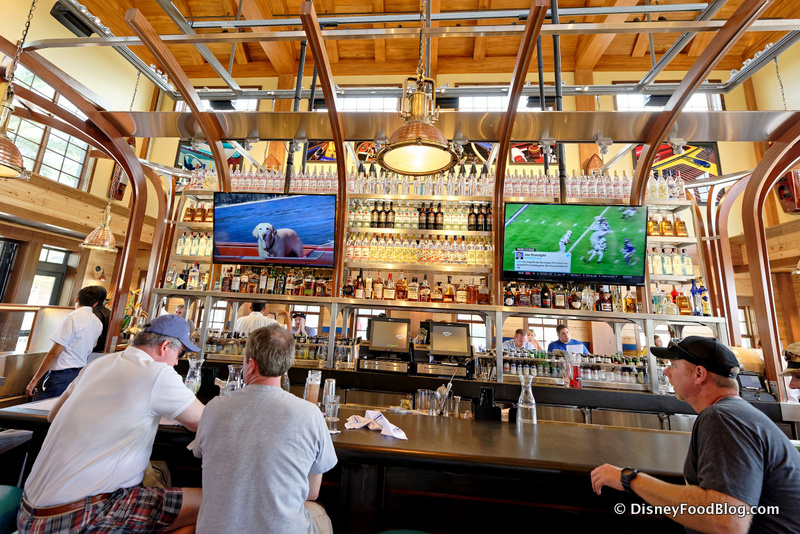 Absolutely loved sitting at the bar out in the water, and we’re really excited for all the new happenings at Disney Springs! Prices look high. Gorgeous venue though. Checked on the boatride a few months ago. 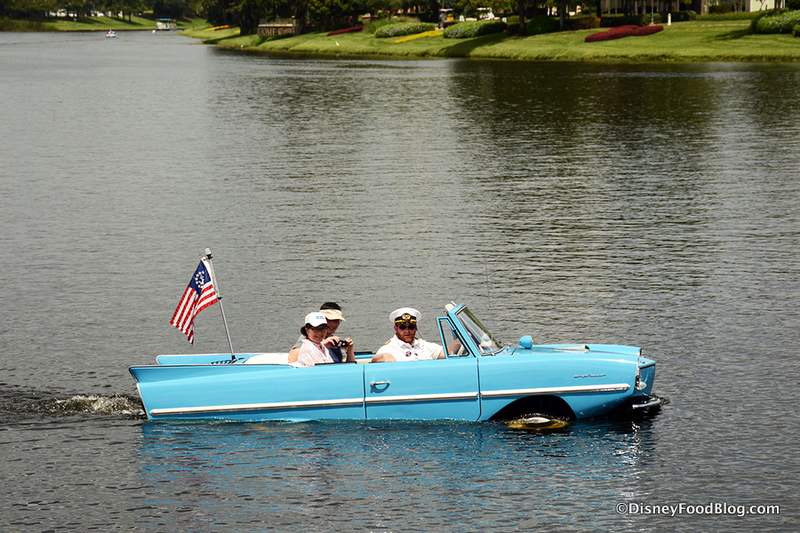 It was/is actually cheaper to buy a one day ticket for the Magic Kingdom than to get a short ride on the lake. 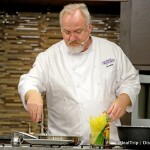 Watched the Chew @ the Food and Wine on TV. 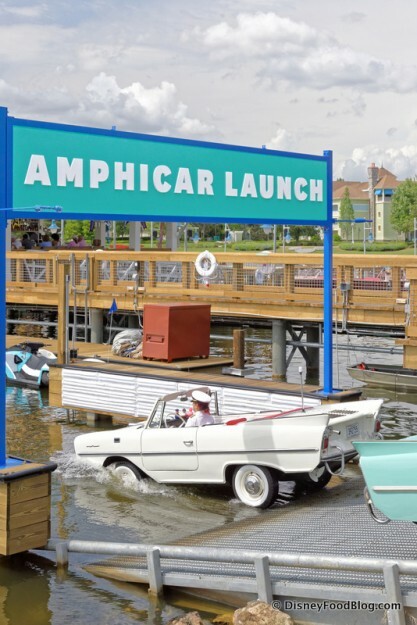 They made it sound like you could take the boat to Epcot.. Unless there’s a route I am not aware of, it ain’t goin’ there. 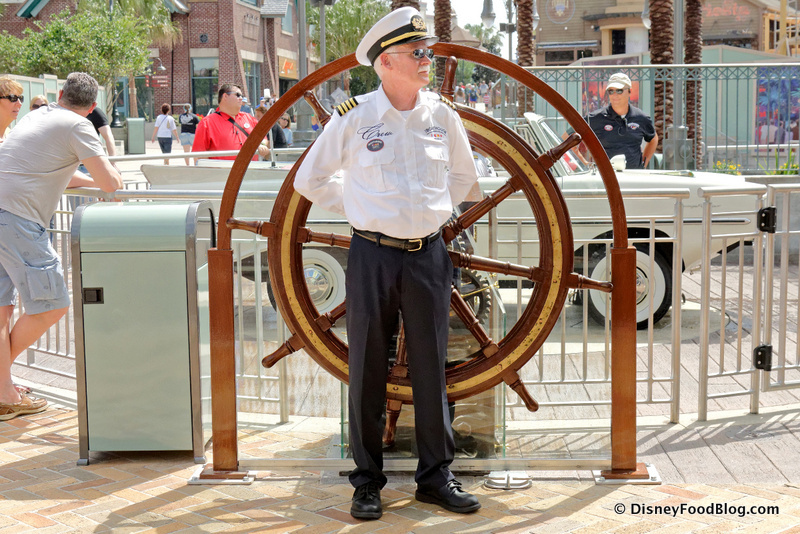 Correct me if I’m wrong, but the staff there are NOT “Cast Members,” in the Disney sense. They are not employed by Disney. We haven’t eaten there. When I see Morimoto’s and Raglan Road, I’m pulled. BTW, we ate at Morimoto’s a few weeks ago for lunch. Had appetizers and sushi. Can’t wait to return. Great food, great staff, gorgeous inside. I Can not Wait to get to the Boathouse!! Its been too long since my last visit to the world. and for the first time in years Downtown Disney/Disney springs is a top reason why. Looks like a beautiful place for a drink and some yummy Seafood. Frank — Good to hear from you, my friend! Yep, you’re right, the BOATHOUSE is not owned by Disney, but is run by another restaurant group! Thanks for your feedback on Morimoto’s! 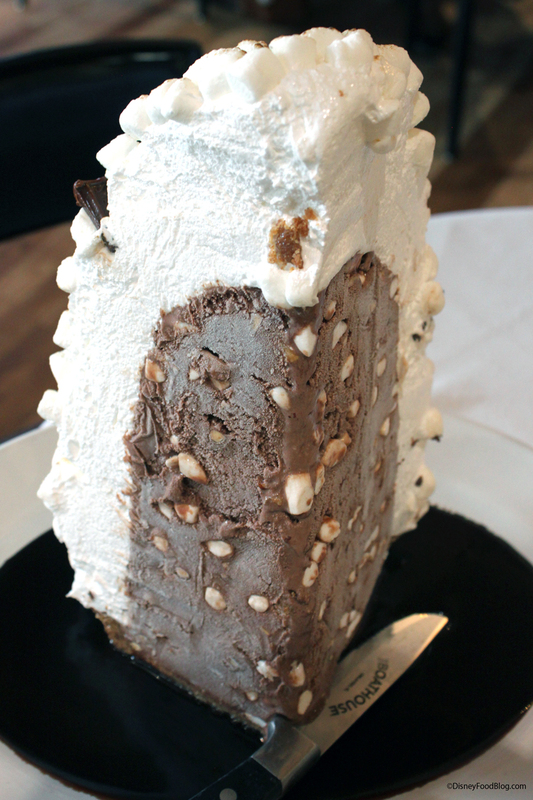 Not sure why all the moaning about the $40 Baked Alaska. It serves four (or I’d guess more than that) and that’s $10/person. The other dessert options are in that range as well, so… ??? Very disappointing. My family and I chose this restaurant over our usual T-Rex. My husband’s $18.00 buffalo chicken salad was nothing but bagged iceberg lettuce and what seemed like frozen chicken strips. The lettuce was not drained well. My lobster in my lobster Mac and cheese was like chewing on a hard rubber tire. They did take back my lobster Mac and cheese, and replaced it with a mediocre steak an hour after my family finished their meal. I was not comped on anything other than the Mac and Cheese. I would think they would have at least comped our drinks for the inconvenience. My sons cheeseburger came without cheese, and was dry. The only upside was our waiter was very nice. This was a $200.00 for 4 people regret! We will opt for Wolfgang or Rainforest Cafe next time. You said it was owned by another restaurant group? Could you tell me which one please? i see a lot of reference to Gibsons. Is this the same Gibsons as in the steakhouse Gibsons restaurant?? I disagree with your baked Alaska comments. Yeah it $40 but it fed 6 at our table so it was a little over $6 a person. I wouldn’t get it everytime or with just 2 people but it’s worth it for 4 or more. 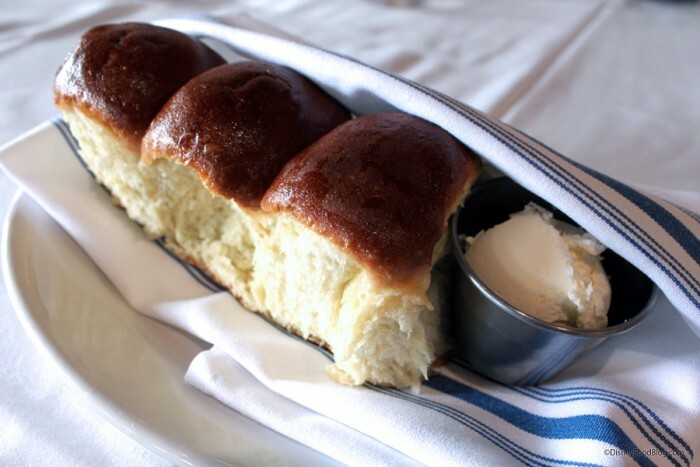 this may sound a little silly, but the dinner rolls at the boathouse are, like, the best in the entire world! I’ve checked at local grocery chains (Virginia) but nothing comes close. 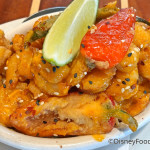 can ANYONE tell me where to find these things other than my bi-annual trip to Disney? Tony, you could try contacting Disney Dining. We can’t promise they’ll give you the intel you seek, but it can’t hurt to ask! 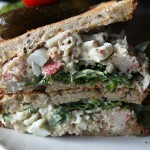 I tried the Gibson’s Sandwich King “Award Winning” Burger on my last visit. For me, it was not so great. It was really messy and goopy, the bun not being able to withstand the contents. And I don’t believe the burger was cooked to order. I may have been especially picky, as I’d had four other burgers this particular trip. 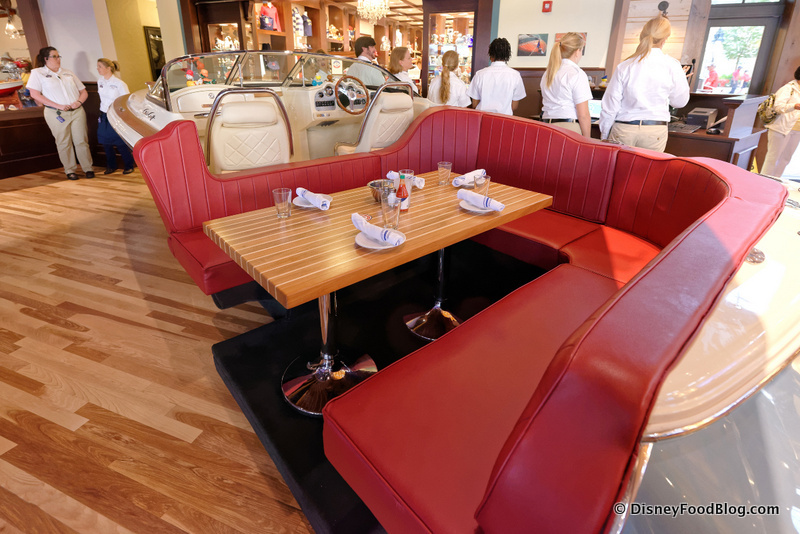 But, considering this one was at a Signature Dining restaurant, I expected it to be the best. My favorite burger of the trip was the Welsh Pub Burger at Rose & Crown, and I even preferred D-Luxe burger to this one. Everyone else in my family ordered the lobster and really enjoyed it. 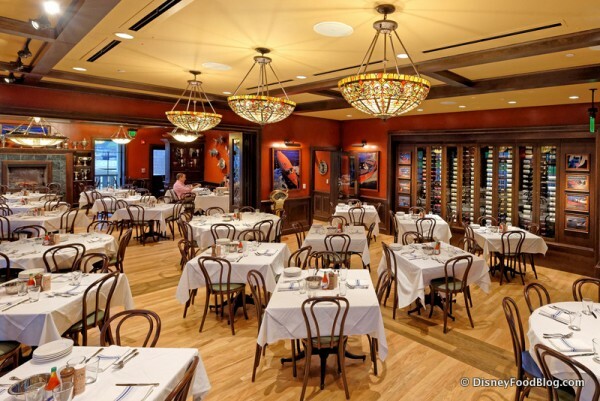 My eight-year old decided she hated the restaurant upon entering because it was “way too fancy.” She had the grilled chicken sandwich, and while she also claimed to hate it, she didn’t refuse to eat it. The Boathouse may be worth a visit if you’re ordering the most expensive items on the menu, and if you think your kiddos (if you have them) will do well.